Mini jumbo toilet rolls 2ply white. 150 meters per roll. 2.25 inch core. FROM £9.31 per case. Mini Jumbo Toilet Rolls 150M 2ply white, 3 inch core x 12 rolls. FROM £9.37 per case. Premium Mini Jumbo Toilet Rolls 150m 2ply white 3inch core 12 x rolls. FROM £9.37 per case. Premium Mini Jumbo Toilet Rolls 150m 2ply white 2.25inch core x 12 rolls. 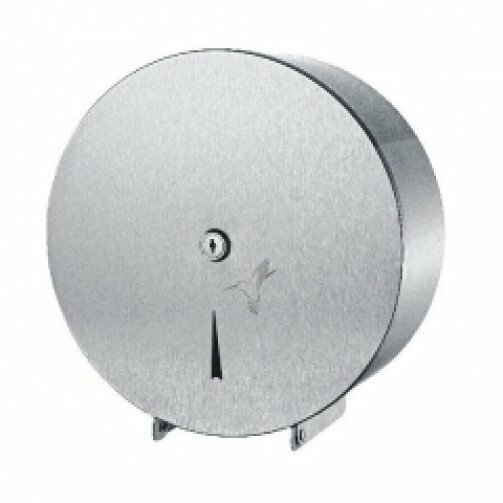 This Stainless steel Mini Jumbo Toilet Roll Dispenser is a lockable dispenser via the key provided and will hold toilet rolls up to 150m per roll. Being stainless steel this is a sturdy dispenser and is recommended in busy areas such as schools and public washrooms. High Quality 430 grade brushed stainless steel construction. Level indicators for fast checks. Universal key lock across the range. Safe touch powder coated mechanisms to eradicate sharp edges. Unique Anti Finger Print gloss coating to maintain aesthetics. Includes fixing kit and 2 keys with each dispenser.